This street is rarely visited because it is a cul de sac, but it is an intact Late Victorian streetscape with a long row of single storey terraces at 5-23 (1887), as well as a motor repair shop with a mural. At the end is an electricity substation, and next to that a tiny planted reserve named after Alice Lee, another stalwart of the Toxteth Branch of the ALP in the 1940s. On the right the path leads to Quarry Street. There were many similar quarries in Glebe in the 19th century, but this one was lucky enough to bag the title. The view west from the electricity substation shows the highwall of the quarry and an even better view of the face can be seen from the nearby Lower Avon Street. The Pederson Steps leading on the left back up to Ferry Road were actually built in 1885 to give access to the timber yards on the shores of Blackwattle Bay, long before the time of Ernest Pederson (see stop 5). 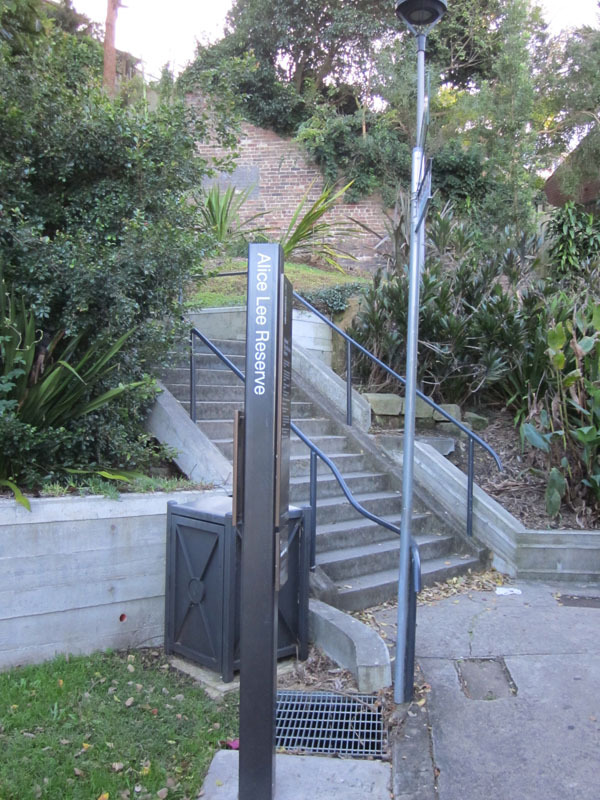 On weekdays in the early morning and mid-afternoon the steps can become quite crowded with students making their way between the College and the bus stop in Glebe Point Road, where you also are now heading. The rock exposed by the construction of the steps is the ubiquitous Hawkesbury Sandstone, both massive and cross bedded, with foreset dips to the north-east. The steps emerge where Avon Street meets Ferry Road, so Glebe Point Road is back past Rothwell Lodge which featured in stop 5 of this walk.